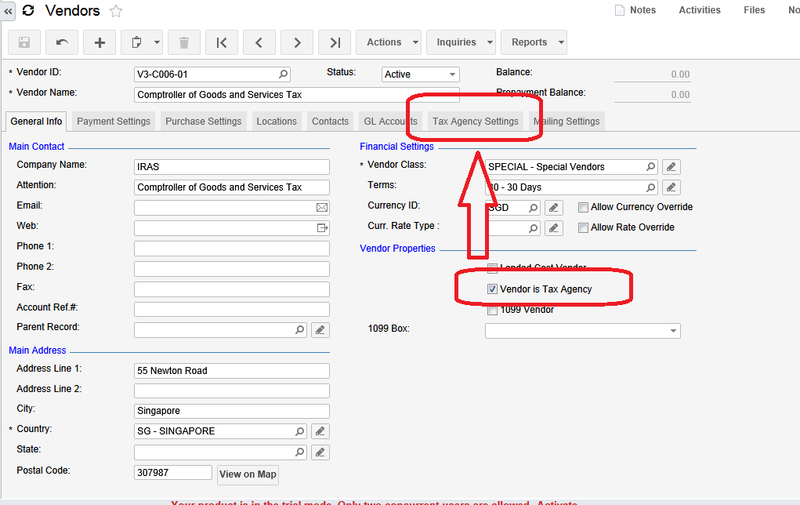 Acumatica Singapore: Setting the Tax Right. Singapore. Here is a quick setup guide for Singapore GST Tax. Its all driven by IRAS requirements for tax codes and their behavior. Here is what tax report should include. Here are what codes are recommended. From a guide for accounting software developers. You can easily find these documents on IRAS web site. In Acumatica ERP we are going to setup TAX module based on IRAS guidelines. Final Tax report should look based on above requirements. 1. Set up a tax Agency. This is done in Accounts Payable module, just create a vendor for Comptroller of Goods and Services Tax in your system. Mark it as a Tax Agency, provide Period for report- in our case its Quarter. Then specify accounts for GST Input and Output Tax. One important option here - I have chosen to report based on period in which documents are posted, not based on original invoice/bills dates. 2. Setup Tax Boxes for GST Report. Remember the IRAS report format - we just need to setup in the system reporting settings and groups. Then for each group we have to specify the lines that we add, one by one. Last two groups we made empty, due to non reporting nature of them. 3. Now lets setup Tax Codes. Here is one example of the tax code, the rest are using the same logic, except inclusive ones. 4. Setup Tax Categories and Tax Zones. Recommended settings below. Tax categories then can be added to inventory or non stock items, while tax zones to vendors and customers. And the combination of Zones with Categories will end up with right Tax Codes.